This post continues my ongoing review of the media management workflow in WP 3.5-beta. This time, I will have a look at the edit media page, which provides detailed information on every item (image files and other media) in your media library. The explanation line for the Alt Text, which isn’t very informative. The conceptual blurriness between “Caption” and “Description”. Why do we have two fields? What’s the difference? The structure looks much more like the generic post editor. The preview of the image is much larger. The “Caption” field becomes more prominent, it is now placed above the Alt Text. The “Description” field has now a formatting toolbar, and is named “Attachment Page Content”. The “Alternate Text” is now named “Alternative Text”. Acutally the most important improvements are invisible: the possibility of using taxonomy UIs, re-parenting, additional fields in a meta box… many useful possibilities, that should be easy to implement with plugins, and will allow more flexible media management. The image is much larger than needed, and forces me to scroll to reach the editable fields. In the previous incarnation, the image was using the “thumbnail” version, which was sized at 150×150 pixels. In WP 3.5, we see the “Large size”, which by default is 1024 pixels wide Update: it’s actually resized to 900×600 by the CSS. I think that as long as we aren’t editing the image, if the purpose of this page is to edit the text fields, this is a waste of screen estate. Even worse: on a rather common 1440x900px laptop screen, with a large image, not only do I need to scroll, but I cannot see the title field and the caption field at the same time. If I want to edit the caption or description, I often want to see the title (it could contain some information that’s useful for writing the caption). So this layout is really unpractical. Another small detail: in WP 3.5, if the URL exceeds the width of the field, the overflow isn’t visible. Actually, it should be always visible, and the field should expand on a second line if necessary. Update: I posted a summary of my observations on trac (#21391). As I said, I think the roles of “Caption” and “Page Content” fields aren’t very clear. Of course, nobody is forcing me to use them – it will be up to each website to the define the use. 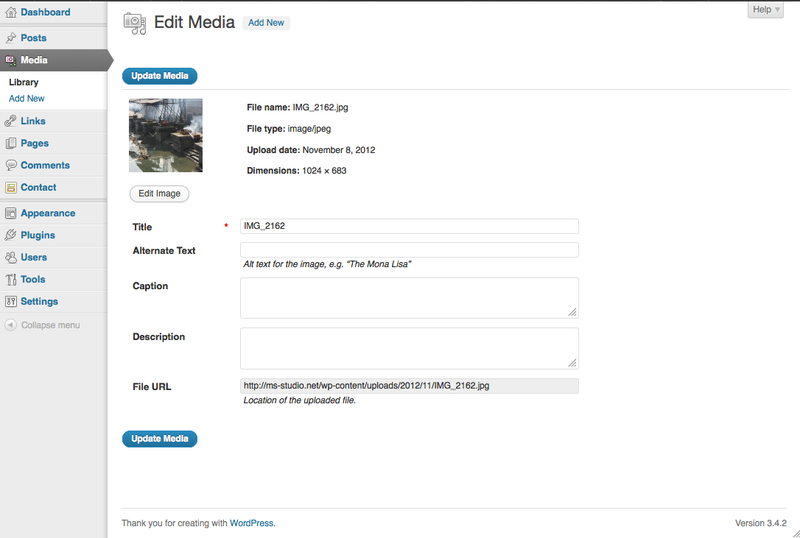 To enable or remove the “Caption” / “Attachment Page Content” fields, site-wide (for all users). To rename “Caption” and “Attachment Page Content” with any other term that fits our use case. Of course, I don’t ask for a configuration interface for this : those expert settings should rather be defined in functions.php by theme authors. My question is: can we currently do this easily? If not, what would be needed to allow this? Update: (Nov 11) Yes, it’s possible, thanks to this method (courtesy Viper)! 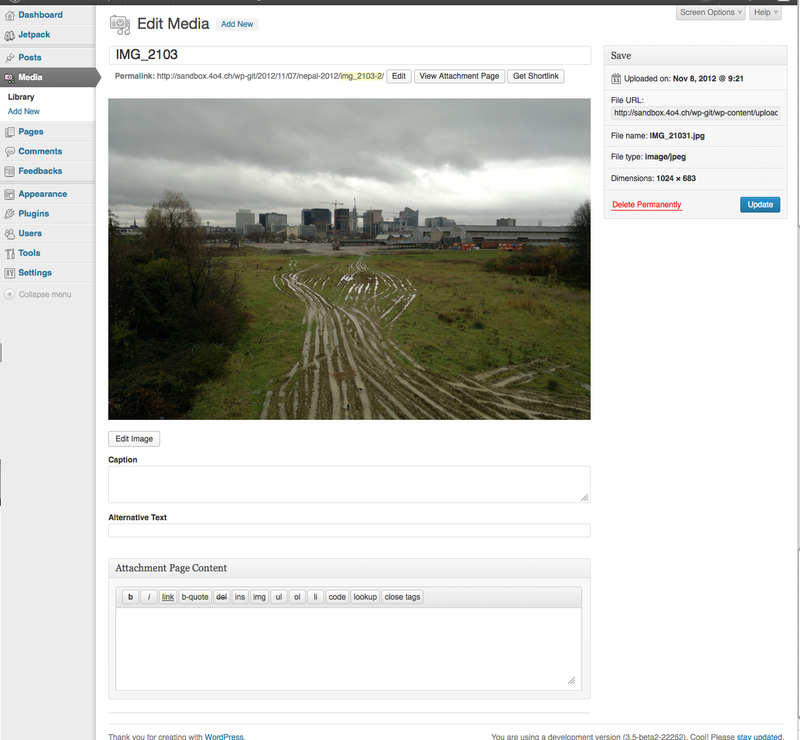 Next Post: Time for an advanced media plugin?